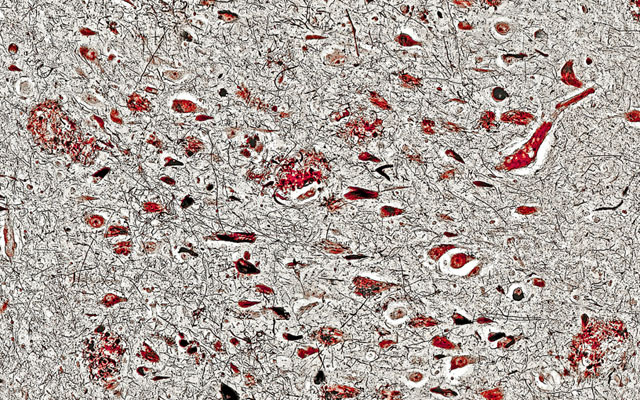 Microscopic image depicting plaques and tangles characteristic of Alzheimer’s disease. Image courtesy of Tom Deerinck, NCMIR, UC San Diego. An international team of scientists, led by researchers at the University of California, San Diego School of Medicine, has identified the microtubule-associated protein tau (MAPT) gene as increasing the risk for developing Alzheimer’s disease (AD). The MAPT gene encodes the tau protein, which is involved with a number of neurodegenerative disorders, including Parkinson’s disease (PD) and AD. These findings provide novel insight into Alzheimer’s neurodegeneration, possibly opening the door for improved clinical diagnosis and treatment. The findings are published in the February 18 online issue of Molecular Psychiatry. Alzheimer’s disease, which afflicts an estimated 5 million Americans, is typically characterized by progressive decline in cognitive skills, such as memory and language and behavioral changes. While some recent AD genome-wide association studies (GWAS), which search the entire human genome for small variations, have suggested that MAPT is associated with increased risk for AD, other studies have found no association. In comparison, a number of studies have found a strong association between MAPT and other neurodegenerative disorders, such as PD. “Though a tremendous amount of work has been conducted showing the involvement of the tau protein in Alzheimer’s disease, the role of the tau-associated MAPT gene is still unclear,” said Rahul S. Desikan, MD, PhD, research fellow and radiology resident at the UC San Diego School of Medicine and the study’s first author. In the new Molecular Psychiatry paper, conducted with collaborators across the country and world, Desikan and colleagues narrowed their search. Rather than looking at all possible loci (specific gene locations), the authors only focused on loci associated with PD and assessed whether these loci were also associated with AD, thus increasing their statistical power for AD gene discovery. By using this approach, they found that carriers of the deleterious MAPT allele (an alternative form of the gene) are at increased risk for developing AD and more likely to experience increased brain atrophy than non-carriers. “This study demonstrates that tau deposits in the brains of Alzheimer’s disease subjects are not just a consequence of the disease, but actually contribute to development and progression of the disease,” said Gerard Schellenberg, PhD, professor of pathology and laboratory medicine at the University of Pennsylvania, principal investigator of the Alzheimer’s Disease Genetics Consortium and a study co-author. “An important aspect was the collaborative nature of this work. Thanks to our collaborators from the Consortium, the International Parkinson’s Disease Genetics Consortium, the Genetic and Environmental Risk in Alzheimer’s Disease, the Cohorts for Heart and Aging Research in Genomic Epidemiology, deCODE Genetics and the DemGene cohort, we had tremendous access to a large number of Alzheimer’s and Parkinson’s genetic datasets that we could use to identify and replicate our MAPT finding,” said Ole A. Andreassen, MD, PhD, professor of biological psychiatry at the University of Oslo and a senior co-author. These findings underscore the importance of using a multi-modal and multi-disciplinary approach to evaluating Alzheimer’s neurodegeneration. “These findings suggest that the combination of genetic, molecular and neuroimaging measures may be additionally helpful for detecting and quantifying the biochemical effects of therapeutic interventions,” said Anders M. Dale, PhD, professor of neurosciences and radiology and director of the Center for Translational Imaging and Precision Medicine at UC San Diego and the study’s senior author. Co-authors include Andrew J. Schork, Linda K. McEvoy, Dominic Holland, James B. Brewer, Chi-Hua Chen, Wesley K. Thompson, UCSD; Yunpeng Wang, UCSD and Oslo University Hospital; Aree Witoelar, Ingun Dina Ulstein, Srdjan Djurovic, Oslo University Hospital, Norway; Manu Sharma, Thomas Gasser, University of Tubingen, Germany; Denise Harold, Julie Williams, Michael J. Owen, Michael C. O’Donovan, Cardiff University School of Medicine, Wales; Margaret A. Pericak-Vance, University of Miami; Richard Mayeux, Columbia University; Jonathan L. Haines, Vanderbilt University; Lindsay A. Farrer, Boston University Schools of Medicine and Public Health; Peter Heutink, German Center for Neurodegenerative Diseases; Andrew B. Singleton, Lenore Launer, National Institute on Aging; Alexis Brice, Sorbonne University; Nicolas Wood, John Hardy, University College London; Maria Martinez, INSERM; Seung Hoi Choi, Anita DeStefano, Boston University; M. Arfan Ikram, Cornelia van Juijn, Erasmus MC University Medical Center; Joshua C. Bis, Annette L. Fitzpatrick, University of Washington; Albert Smith, Icelandic Heart Association; Dag Aarsland, Karolinska Institute, Sweden; Tormod Fladby, Akershus University Hospital, Norway; Bradley T. Hyman, Massachusetts General Hospital; Jon Snaedal, University Hospital Reykjavik, Iceland; and Hreinn Stefanson, Kari Stefanson, University of Iceland. Funding for this research came, in part, the National Institutes of Health (grants R01AG031224, K01AG029218, K02NS067427, T32 EB005970, UO1AG032984, U24-AG041689, and R01 MH100351), the Research Council of Norway, the South East Norway Health Authority, the Norwegian Health Association and the KG Jebsen Foundation.